If you follow me on twitter, you may have noticed a lot of tweeting about my recent project, White Room: 02B3. But being confined to only 140 characters at a time, I was very limited in the amount of information I could divulge. WR:02B3 is a very complicated project, mostly in that it is actually three projects in one! 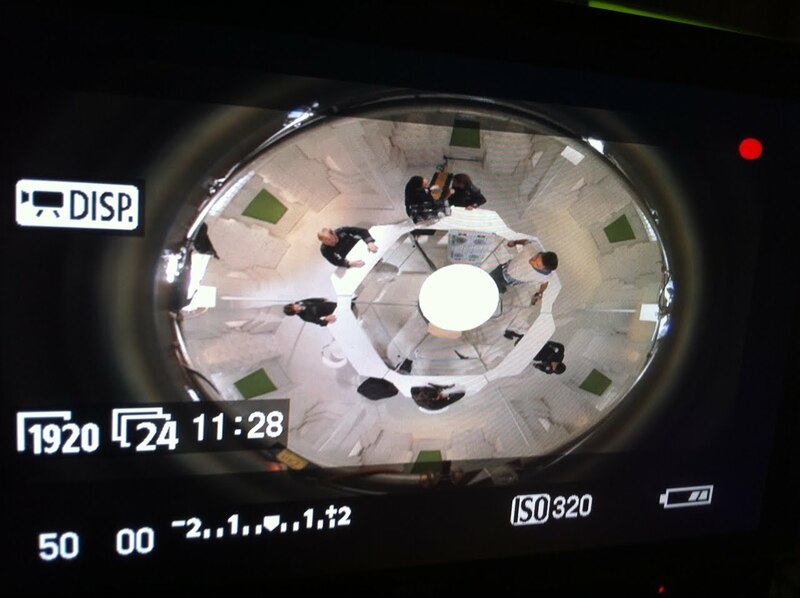 The most intriguing of which is an experimental 360 degree version. If you follow my blog, you have probably figured out that I am usually pretty tight lipped about current works-in-progress, and usually don't post images or stories until the entire project has been made public. I grew up in the glorious age of Amblin Entertainment and Lucasfilm, where every next project was a secret, a covert operation with code names and fake news leaks to keep fans guessing. There was so much more mystery and magic to that time, as opposed to present day, when you can practically download a rough cut of a film before the director has even seen it! 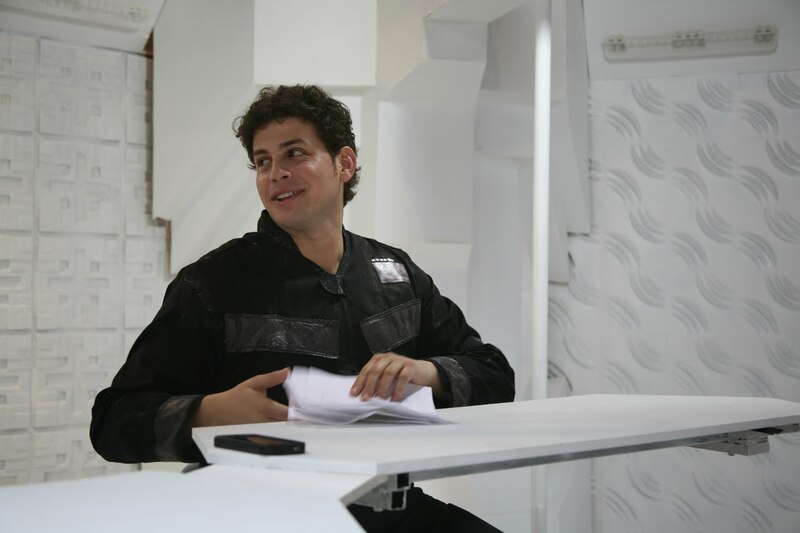 But not all projects need to be kept under wraps, and we decided internally at Roddenberry Entertainment that our experiences creating WR:02B3 should include our audience from as early as possible. So I am blogging about it now, just hours after wrapping the first tier of our shoot. Mazin created a virtual model in 3D Max based on my quick and crappy pencil sketches, then proceeded to construct the six pillars that would be the cornerstones of the room. 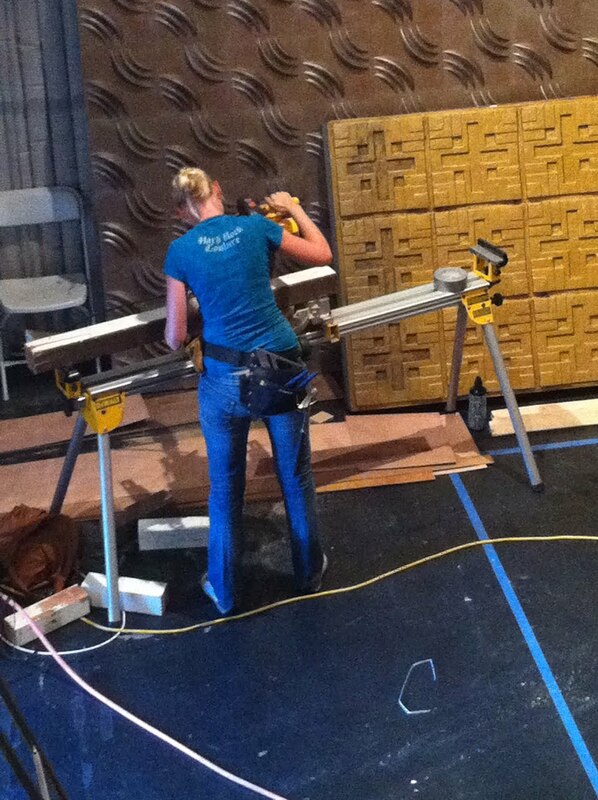 Kirsten resumed her usual roll as Construction Coordinator, and used her master builder skills to put the rest of the set together. 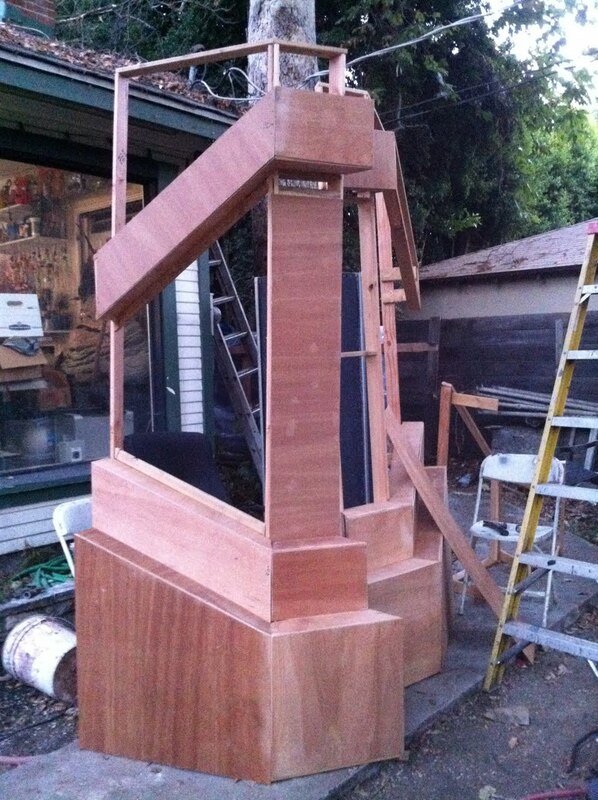 As I am always acquiring pieces from other projects, and constantly trying to build bigger sets on smaller budgets, it is not unusual to find me re-using flats and materials. WR:02B3 was no exception, and many of the elements I pulled in have a little bit of sci-fi history to them. 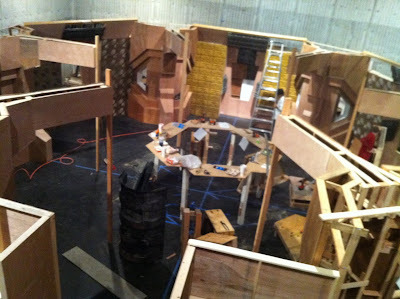 There are old flats from BladeRunner, new walls from Real Steel, vaccumformed panels from Roger Corman, and plastic grating from James Cameron. 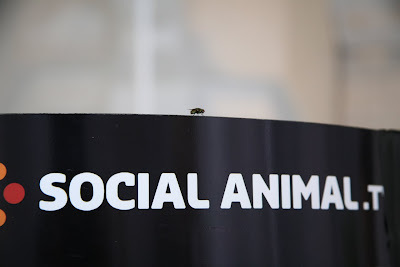 Once there was enough set standing to really understand the space, Social Animal brought in the SA9 360 camera for a test shoot. This custom built camera rig uses nine hi-rez cameras that shoot into angled mirrors to create one continues three hundred and sixty degree frame. That's about as technical as I can get. Usually, I just say it looks like an Imperial probe droid! When the camera test was successful, and we knew all of the walls were in the right place and all of our math was correct, it was time to paint. Time was running short, and we called in all the help we can get. It was a total honor to have Brooke Lee, a bona fide Miss Universe, jump in and paint a huge portion of the set! My friend Milynn Sarley, of Team Unicorn fame, also jumped in to help. Milynn is one of the stars of WR:02B3, so it was exciting to have her join the art department, too. 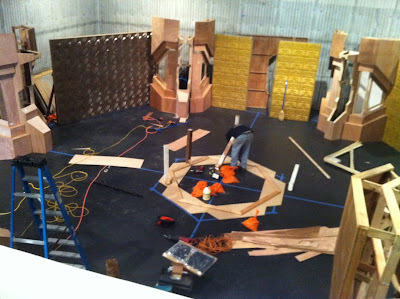 You know, just another day in Hollywood, having the most beautiful women in the world...scratch that...in the universe, painting your set! Tough job, but some body's gotta do it! 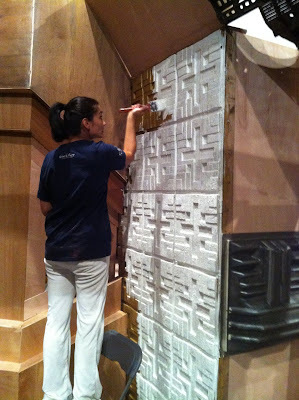 The next step was lighting the set, so Director of Photography Chris Darnell brought in his team to highlight all of the textures and facets the WR art department created. It was very exciting to see it all become reality. It always cool to see any set I design come to life, but it feels different when it's a set I'll be directing on. Another aspect of the project is showing the 360 version of the film in dome theaters around the country. This is a whole new medium for us, so the team went to visit dome projection experts prior to filming. 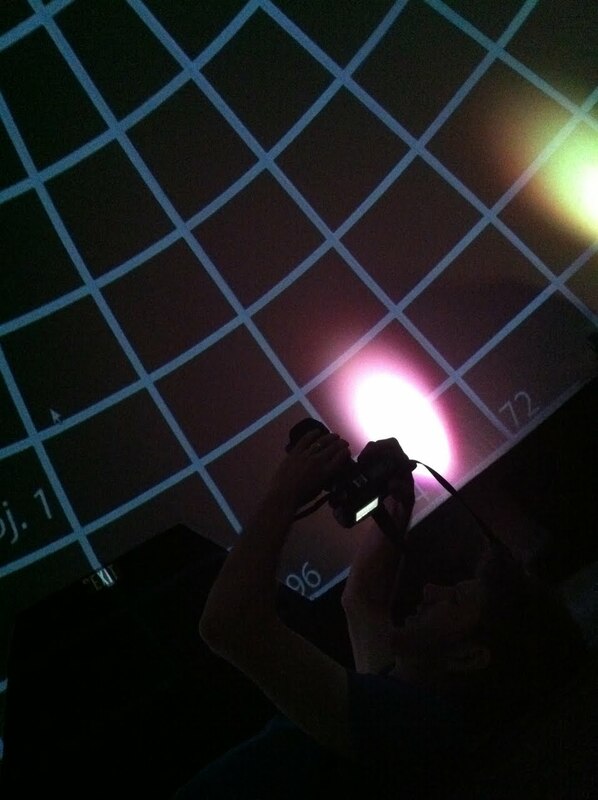 Here, Chris takes reference photos of a dome grid, used to align the multiple projectors that create a seamless 360 images. 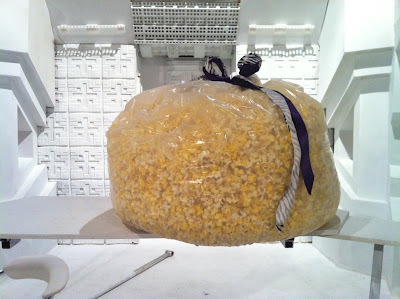 Apparently, it is a commonly known fact about me that I LOVE popcorn. Even more specific, stale popcorn. I simply cannot watch a movie without popcorn, and I make a habit of getting the largest bucket, and bringing everything left over home with me to enjoy for the rest of the week. Roddenberry executive producer Trevor Roth thought that if I needed popcorn to watch a movie, I was going to need a ton of it to make a movie! And so was inspired the coolest first-day-of-shooting gift I have ever gotten. This will probably last me till the premier!!! Everything was ready, and it was time to bring in the cast. My buddy David Blue joined us as SIX. He was perfect for the role, and his strong sci-fi background made him an important part of the "melting pot" I was trying to create under the Roddenberry label. I had drafted David in the past for a cameo in my "Guild Sells Out" faux commercials, but it was such a quick shoot, it was great to actually work with him again in a part he could sink his teeth into. And of course, Milynn. She was FOUR, and got to play the most action-oriented role. I know Milynn from Team Unicorn adventures, and I was thrilled when she accepted my invitation to be a part of my sci-fi experiment. And this won't be the last you see of this unicorn in the White Room! 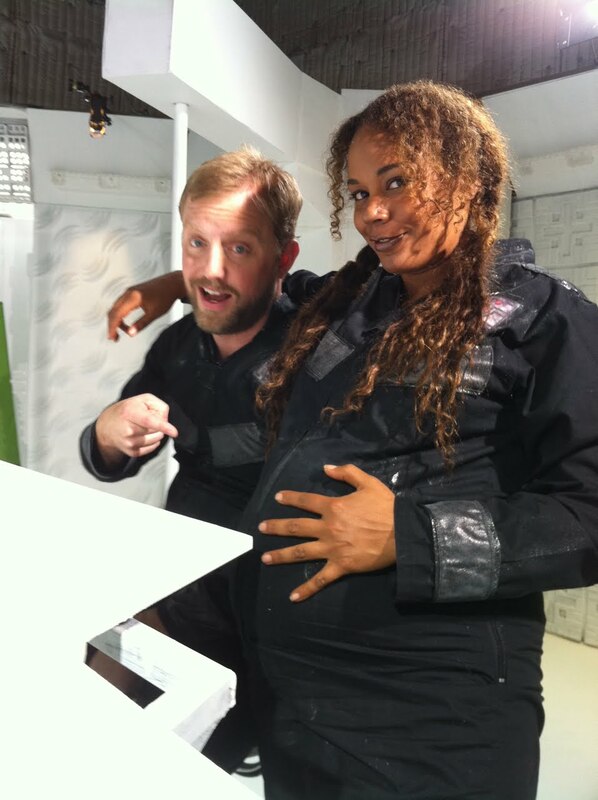 Her awesome teammates joined us on set for a Star Trek photo shoot, which will be heading your way soon! That is indeed Rachel True from "The Craft", and the dude pointing at her fake baby belly is none other than Tony Janning, known for a little web project I like to call "Legend of Neil", or "Pure Awesome" for short. This was really my favorite part of the WR project, the dichotomy of huge movie stars from block buster films working side by side with rising internet sensations. 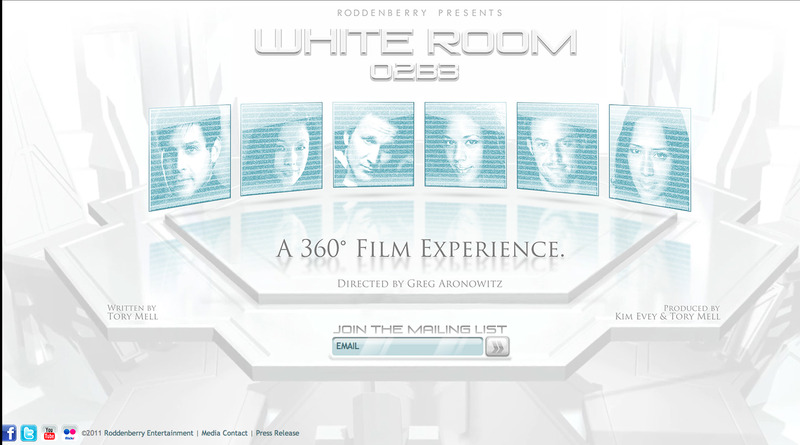 White Room: 02B3 is a sci-fi/drama, with a tinge of thriller, which was no new territory for Rachel. She spun her character's web effortlessly, delivering an intoxicating performance as THREE. But Tony has a strong comedy background, and it took some pressing on my part to get his headshot to the top of the TWO stack. I have to admit it was my proudest moment on set when Tony did his key scene, and I turned to see every one's jaw on the floor. He is a super talent, and I promise you will be seeing a lot more of him on screens everywhere around you. The actual shooting schedule was pretty crazy. 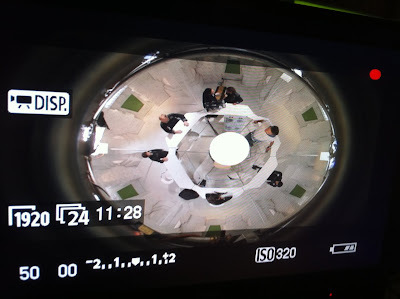 As I mentioned, we were attempting to shoot three separate versions of the script: a traditional film, an online 360 experience, and a dome theater version. I had to figure out a blocking and timing that would work for them all, but the camera work had to be handled differently for each. Here, I'm talking to my 1st AD, Kate, who is in charge of keeping the set on schedule. 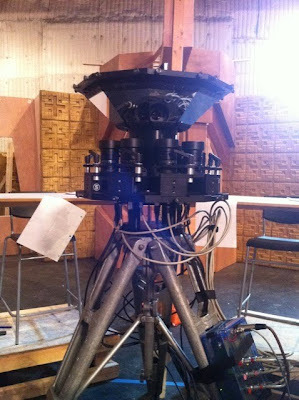 Since the genesis of the project was the 360 concept, the original schedule focused around that section of the shoot, and we were going to start with the SA9 camera. That meant that the actors had to perform entire multi-page scenes in a single take, almost like live theater, right on the first day. We did several days of rehearsals to prepare, but producer Kim Evey made the decision to reverse the schedule and shoot the 360 versions last. 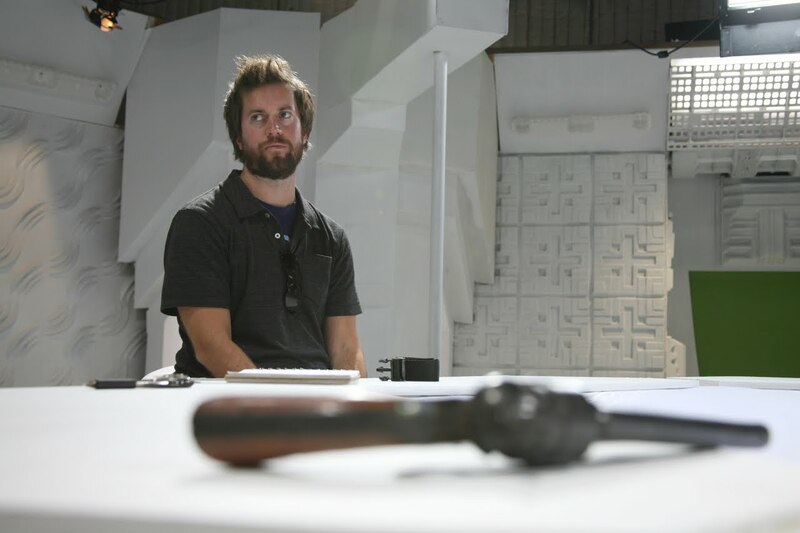 This was probably the best decision of the production, as it allowed me to work individually with each cast member during close-ups for the traditional shoot, and make subtle changes to character and dialog that we wouldn't be able to adjust in the 360 single takes. After the traditional shoot, Social Animal came in to rig the SA9 360 camera. It's funny to me how often I have used the term "traditional shoot" in the past few months. I don't think such a term even existed a few years back. It would have been just "a shoot". I guess now with 3D, Imax, 360, and who knows what else, just shooting a single camera 2D narrative film can be considered "Traditional". Matt from Social Animal takes a break from setting up massive amounts of equipment to stand in for focus and skin tone tests. The hardest part of setting up the 360 view for me was figuring out where to put the gun. 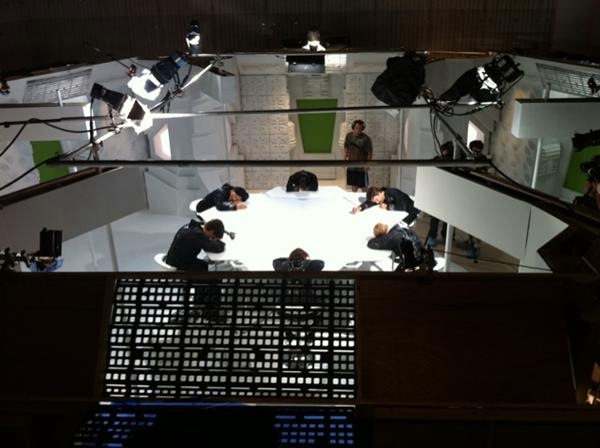 In the traditional shoot, I had it in the center of the table. 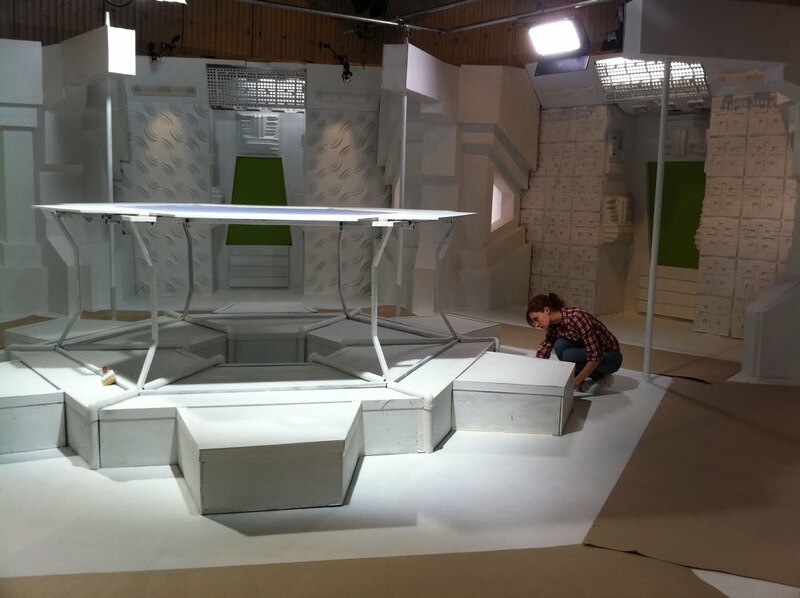 But for the 360 version, the center of the table was removed, and the camera was installed there. Well, not everything was in groups of six... In order to monitor the 360 takes, I had to watch nine screens all at once. 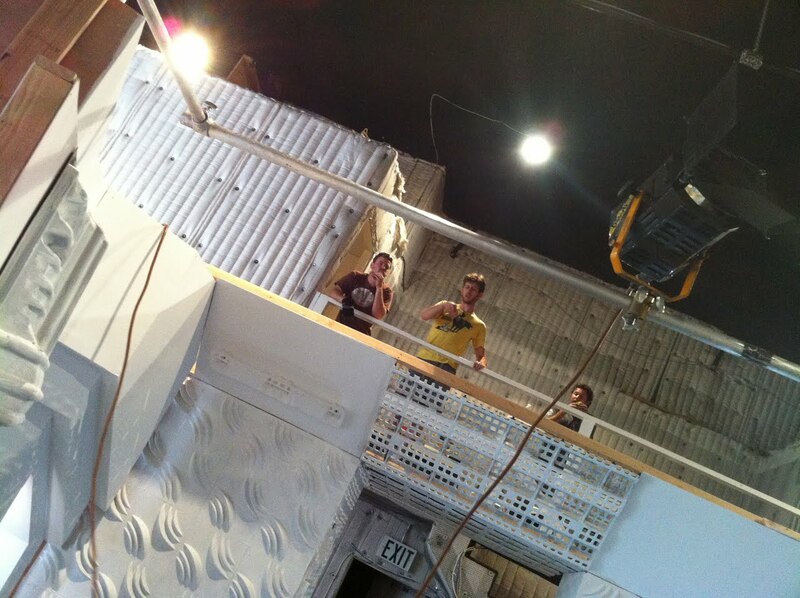 As actors moved around the room, they jumped from one screen to the next. It was very confusing at first. 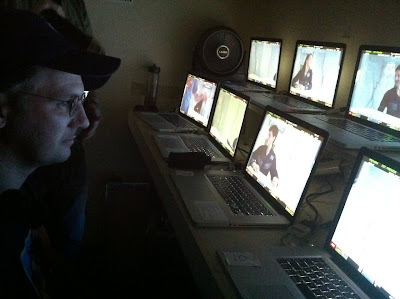 To make sure I didn't miss anyting, since there was no way possible to focus on every monitor at the same time, I had three script supervisors taking constant notes. They divided the monitors into groups of three each, and I followed the main action across all nine. Unlike a....wait for it...traditional shoot, there were also many new rules that had to be followed to determine what was a good take. The actors had "no fly zones" where the camera couldn't see them if the stopped, and boundries they couldn't cross, like the top of frame. If so much as a finger tip grazed the boarder, I had to yell cut and start over. Which reminds me of another crazy thing. Since I couldn't have an eye on every monitor, the scripties needed to be able to talk to me as they saw questional issues. Talking on set usually ruins sound recording, so we had to set up our video village in a soundproof closet of to one side of the stage. It may have been alright if was just me, or maybe a few people, but ultimately we needed to cram a dozen people in there to operate, monitor, and advise. It definitely got a little toasty in there! 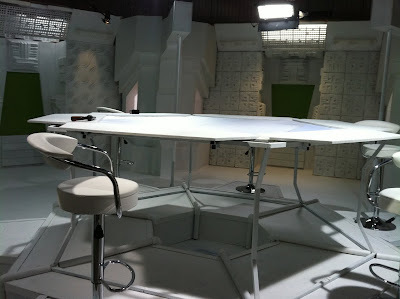 The toughest job for the art department was keeping the White Room white! 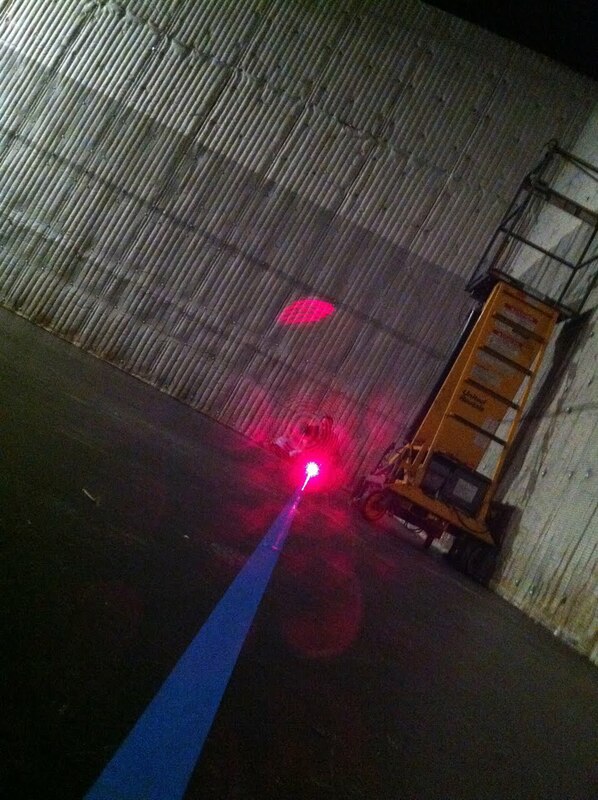 Keeping with the theme, Red 5 jumped in to do touch ups between scenes. Red wasn't originally scheduled to work on WR, but she was able to free up some time and join in. I'm glad she did, the set would have never been finished without her! I am always mixing and matching my Star Wars and Star Trek. Shooting WR was no exception. 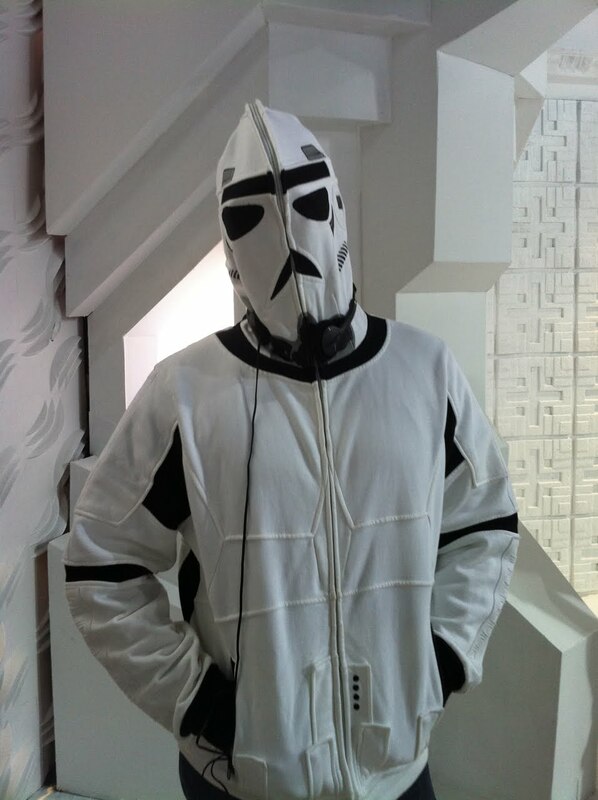 I grabbed my Marc Echo Stormtrooper hoodie on the way out the door, and the joke on set was that if I zipped it up, it was like White Room camoflage. I didn't keep it zipped for too long, though. 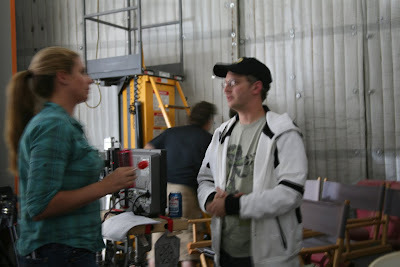 I think it freaked the cast out when I was giving direction! One member of the cast that I wish was wearing camo was this damn fly! He made his way onto the set early in the day, and taunted me relentlessly till the wee hours. He will probably cost the production thousands in post fly removal. We shot the traditional version on RED, so I'm sure I will be able to see his wings flapping in the 4K resolution! I imagine it to look something like this! 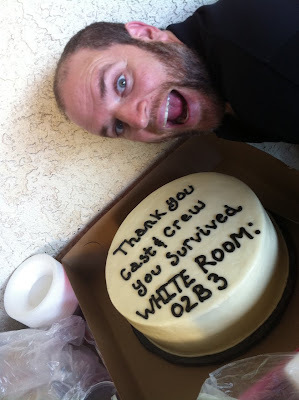 No, that's not a macro photo of the sci-fly buzzing around the crew cake, that's writer/producer and good friend Tory Mell. Obviously, you can tell, he probably has some insect DNA in him, though. 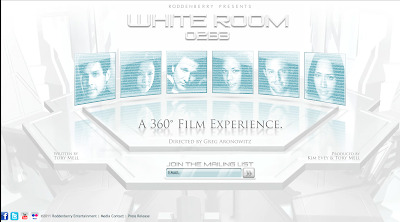 So that's my intro spiel on White Room: 02B3. There is so much more to tell, but I want to save something for later! I'm sure you will be hearing about this project from me a lot over the next few month, and I have to say that it is refreshing to talk about it at this point instead of another retro-blog with a cryptic intro. Let me know if you have any questions, and I will keep you up to date as things progress. I want to thank my amazing cast and crew, who made this experience both pleasant and possible! And a special thank you to Rod Roddenberry for allowing me to helm the first original Roddenberry production since Gene left us. It is a huge honor to be a small part of such a massive science fiction legacy. When I was eight years old, hiding my black and white television under the covers so I could sneak in an episode of Star Trek past my bedtime, I never imagined I would someday be part of that universe. It's still hard to believe it now! It was a very short trip, about 30 hours total, but I dropped in on Wizard World Chicago to sit in on a Rock Jocks panel with Felicia. What is Rock Jocks? Oh, yeah, I guess I haven't talked about it very much, but every other tweet or mention about a secret project over the past 6 months was most likely referring to it. Since everyone in Chicago knows what Rock Jocks is now, I should probably bring you up to speed, too! This is a film I executive produced with my partner Sheri Bryant. It was written and directed by Paul Seetachitt, and I stepped in for Production design and make-up fx. The basic premise is that there is a secret government agency that monitors and shoots down rouge asteroids, saving the Earth every day. But due to constant budget cuts, this program is now run by those deemed otherwise useless to society. It's CLERKS meets WARGAMES. Alright, I've got to go. I'm directing a movie right now, so my time to blog is pretty short. I'll post more info on Rock Jocks as it is made available, and I'll try to blog about something else before the end of the month!